Let me tell you our story... Tony and I were high school friends. Our dad's were both barbers. That’s right, actual ‘pole out in front of the shop’ barbers. I know, crazy, right? Two barbers - have two sons that end up working together too. Only this time, it was cleaning. Anyway, our hometown is Toledo, Ohio. Yeah, that Toledo - just an hour south of Detroit - hometown of Katie Holmes (before she met Tom) and Jim Leyland (Go Tigers!). Oh, and, for those of you old enough to remember, Jamie Farr, the dress-wearing, wacky ‘Corporal Klinger’, from the hit TV show M.A.S.H. Anyway, after seeing up-close the frightening lack of job security in the auto industry, Tony and I were determined not to spend the next 30 years working for someone else - constantly having to worry about losing our jobs. We dreamed of running our own business. The only problem was - money. That’s right, we didn’t have much of it, and all the businesses we looked at getting into required a whole lot more to get started than either of us had. Then one day...we got lucky! That’s right, only after we bought the business - did we find out why!! Anyway, we sold everything we had to come up with the down payment. The rest, we had to pay back to Jim in monthly installments. But, we were so proud. We Thought We'd Died... And Went To Heaven! Unfortunately, we quickly found out - we only had the FIRST part right! Ugh! We spent all our money on the down payment. So when the very first payroll came due along with the rest of the bills - we didn’t have the money! We were sick to our stomach scared as we pulled out our credit cards just to get by. But, it got even worse - fast. Even our name was a disaster. Yeah, I forgot to mention - the name of the little cleaning company we just spent every last penny we had on was - JIM’S CLEANING. Right, like we didn’t have enough problems already. 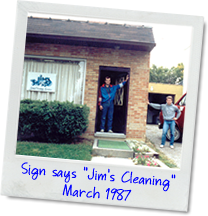 Here we are, Tony and I (Dan), running a company all the customers know as Jim’s Cleaning, yeah - Jim’s!! Nice, huh? So, there we were, sinking - two desperate guys with no money, experience or frankly, idea of what we were doing. Everyday we just frantically tried to keep our little cleaning business from going ‘out of business’ right before our eyes. Both Tony and I had wives. And, oh yeah, one child each. (Too bad they were still babies - we could have used the extra help). Well, I’d be lying if I didn’t admit we were scared. We were. But, that wasn’t the end of our problems. Did I mention that Tony hates people? Well, that's not exactly right, it’s people problems he can't stand and he sure wasn't excited about having a bunch of employees to deal with. 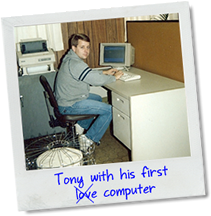 See Tony's a ‘computer geek’ -he likes numbers and systems - stuff like that. I know, I know, why in the world would a guy like that even think about getting into the cleaning business? Well, let’s just say, he’s a good friend… and I talked him into it. God bless him. Well, as you can probably imagine, we worked night and day. We worked till late at night, only to turn around and have to get right back into the office first thing in the morning to fix any problems from the night before. And there were always problems. Well, unfortunately, yes. There was never enough money. At one point, we were over $20,000 in debt and that was just on our credit cards - and that didn’t even count how much we owed Jim. The truth is we seriously overpaid for the business and had to take out a huge loan with Jim - the prior owner. How were we doing finding help? We'll, let's just say we'd place ads, and more times than I care to admit, no one, that’s right NO ONE even showed up to interview!? But, what about the employees we did have? Well, on top of being short-handed, some of the folks we did have weren’t great. Ok, even some of them were just, well, down right - trouble. "Oh yeah, man, sorry about that, I was too stoned!" Oh, great, there's a reassuring answer?! What in the world had we gotten ourselves into? And just when we thought it couldn't get any worse, you guessed it - it did! First, our dependable ‘fleet’ which consisted of a couple old cars and a horse trailer; yep, a horse trailer, which we used to transport scrubbers and wet vacs, was slowly - but surely falling apart! Then our "loyal" receptionist - stole thousands of dollars right out from underneath our noses! Money we couldn’t afford to lose. I know, shame on us. The only bright side was - we finally figured out why we couldn't find the postage stamps and office supplies the handwritten ‘receipts’ said she had bought! But, don’t worry, at least we had our accounts, right? I mean, at least we had our loyal customers? Well, back in those early days, we counted on a couple big manufacturing jobs just to stay afloat, so we nervously ‘babied’ them night and day - so they'd stay with us. … 'dropped us like a rock' with no notice! The reason they gave for dumping us was something like "Well, the owner's kids think they want to do the cleaning for a while, because, as they put it, how tough could it be, right?" We were completely burned out, financially wiped out and holding on by a thread. And we'd have gotten out completely if we could have, but to sell a business - someone’s got to want to buy it. But, of course, no one did. I think I can hear you saying, "STOP - Enough already!" The good news is.... that was NOT the end of the story!! That's right, suddenly everything changed! At our lowest point, we discovered a set of powerful NEW strategies for bidding, marketing and selling! 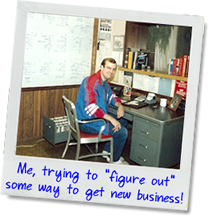 And we turned those strategies into automatic systems in our cleaning business - that changed our lives completely. So, What Is Life Like Today? Well, Tony and I stayed friends. We built a cleaning company that delivered over $2,000,000/yr. in office cleaning and related services! 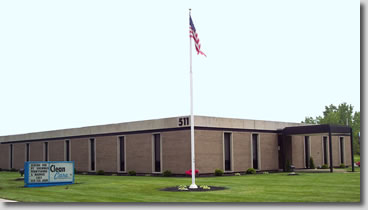 We have a steady stream of profitable business coming in every year. We have systems to run virtually every part of the business so it can run profitably and smoothly every day - without us! And other than paying the monthly mortgage on our beautiful building - we're debt free! Oh yeah, Tony loves to go to exotic places to scuba dive with his wife and kids. Me, I just love to take the family up to our place on the lake to go skiing, or just relax. By the way, that 'thing' I'm wearing is a 'safety device' to keep my head from frying! That’s right - give independent cleaning business a chance to compete and win against the slick franchises, empty promising national management companies and low balling outfits! 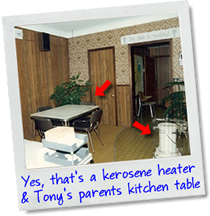 We’ve learned a lot in our over 20 years in the cleaning business. Now, we're on a mission. You see, we want to help other cleaning business owners who may be struggling like we were. We want to give them amazing tools to help them FIND, LAND and KEEP PROFITABLE cleaning jobs! We know it's tough out there - and it's getting tougher. But, you can still WIN like we did. And we want to show you how. We struggled for years trying to find an effective, affordable and easy to understand method to create bids. We looked to other cleaning companies and industry experts for help, but were disappointed with what we found. But we were determined to find a solution for cleaning companies with a simple, affordable, and competitive way to create professional estimates and bids. NOW, it's a reality with CleanBid®! Janitorial Bidding Made Easy®! Check our FREE demo to see for yourself just how fast, easy and professional it is. And, the best thing is it's online and ready for you 24/7, anytime you want to bid a cleaning job. Plus, it comes pre-loaded with industry specific cleaning tasks and gives you everything you need from price recommendations to incredible, ready-to-deliver proposals. Enough talk. Today is your day! Make it THE day you decided to change your cleaning business for the better!